Nancy Pelosi at AIPAC, earlier conference. I’m tempted to change my party affiliation from Democrat to non-partisan over this single issue. I won’t. Instead, I’ll address the weekly and monthly Party groups I attend and explain to people who are ignorant about how AIPAC operates how this works. I believe that Rep. Omar has been intentionally humiliated over this issue. Intentional humiliation, you bet. What has changed since Helen Thomas or Roger Garaudy/Abbé Pierre? We keep saying that the accusation of anti-S is losing its sting with repetition but there is very little evidence of that. Best of luck with the Party meetings, Philip. But you won’t find it easy with an ‘unequivocal apology’ ready to be waved in your face. Someone setting out to do the same in the Labour Party would be silenced rapidly, I think, with the threat of expulsion. If we have a General Election the accusation against Corbyn will be repeated six times a day. That said, it is surely true that politics depends a great deal on lobbying and that pro-Israel lobbying spends a lot of money. I regret the results of that and don’t see why I or Ms. Omar should regret, even condemn it any the less because many of those involved are Jewish. It is deeply racist to demand that we should. However, politicians usually take money to do what they would do anyway and the moral element – the mistaken moral element – of thinking that Israel represents the final act in the defeat of Hitler and the final purification of the Christian faith is very strong. Just to get off my chest that I watched an Independent TV news report the other night about Israeli bombardment of Hizb positions in Lebanon which in its uncriticality and militaristic tone – even loving dwelling on the hot, phallic guns – took me right back to the 70s when I heard a report – BBC that time – of something Israel did as ‘a good deed in a naughty world’. Of what other foreign country are such admiring things said? What has changed? There is an ever-increasing list of things we are forbidden to say or think, on penalty of being denounced and persecuted as a hater, a denier, a xenophobe, a socialist, or something similar. But anti-Semitism, as defined by the accuser, is still on top of the list. Any attempt to defend against the charge is likewise deemed further anti-Semitism. “Progressive critics on Monday condemned a statement by Democratic congressional leaders including Speaker of the House Nancy Pelosi—who demanded an apology from Rep. Ilhan Omar (D-Minn.) regarding statements she made about the powerful American Israel Public Affairs Committee (AIPAC). “Among those critics was healthcare activist Ady Barkan, who said he was ‘deeply disappointed’ in the Speaker’s ‘failure’ on the matter. “And while Omar on Monday afternoon did ‘unequivocally’ apologize for a pair of tweets Sunday night that some registered as containing ‘anti-Semitic tropes,’ she reaffirmed her belief that powerful lobbying interests—including AIPAC, the fossil fuel industry, and the NRA—remain ‘problematic’ in U.S. politics. “Omar’s apology for her comments came shortly after she was rebuked by members of her own Democratic Party, led by Pelosi. “‘We are and will always be strong supporters of Israel in Congress because we understand that our support is based on shared values [**] and strategic interests,’ the House Democratic leadership said in a rare joint statement. ‘Legitimate criticism of Israel’s policies is protected by the values of free speech and democratic debate that the United States and Israel share.’ Such a statement, of course, immediately drew outrage from human rights advocates and progressives. “Earlier in the day, journalist Glenn Greenwald appeared on Democracy Now! where he condemned those attacking Omar and also challenged the notion that being critical of AIPAC has anything to do with being anti-Semitic. It is remarkable that a bald statement of fact leads to spurious accusations of racism, but this is America, maybe she should be invited to a screening of Black Hawk Down, to get a handle on this gross racism thing. “Ilhan Omar, a Muslim women from Minnesota and one of the new Democratic Representatives in the House, is now being accused of having used ‘anti-Semtic tropes’ and ‘prejudicial accusations about Israel’s supporters.’ House Speaker Nancy Pelosi and others said they found her words ‘deeply offensive.’ What had Omar said? Well, basically, it went like this: ‘Republican support for Israel is fueled by campaign donations from pro-Israel groups like AIPAC.’ Wow! What a bad thing to say! “There are several things that make Omar’s statement superficial, but none of them detract from its core truth. Basically, the problem with Omar’s assertion is that it was made without supporting context and is incomplete. These are important points and the consequences of omitting them are real. “It is certainly not just the Republicans whose support of Israel is ‘fueled by campaign donations.’ It is also the Democrats, and Omar might have expected that her claim would call the motives of her fellow Democrats’ support for Israel into question as well. No doubt Pelosi caught the connection and that may be one of the reasons she quickly demanded ‘an immediate apology’ from Omar. There are two other points to be made here: One is that the connection between Zionist organizations and the federal, as well as state, politicians of this nation are at least a century old. That means the deal whereby this particular group gives money and the other party delivers legislation and foreign/military aid is so established that it is generally taken for granted. When Omar questions the propriety of this arrangement it is a shock—even for the politicians. The second point is that it is probably true that some politicians, say Senator Chuck Schumer and Vice President Mike Pence, support Israel for personal or religious reasons and would do so whether they are monetarily rewarded or not. However, such politicians are probably in the minority. “Moving on, we can note that Omar states that the campaign contributions come from ‘pro-Israeli groups like AIPAC.’ She probably should have left out the example of a mostly Jewish group (AIPAC) because by throwing it in she opened herself to the charge of anti-Semitism—specifically, as her disparagers allege, she (apparently without knowing she was doing so) ‘invoked the anti-Semitic trope of Jewish money.’ Of course, the truth of the matter is that it is not only ‘Jewish money’ that is involved here (though Sheldon Adelson did give Republicans tens of millions of dollars in 2018). It is also ‘Christian money’ in the form of donations from Christian Zionist individuals and organizations. And, finally on this point, the fact is that AIPAC as an organization does not make financial contributions, but is quite active in suggesting to other donating groups which politicians are worthy of receiving such largess. “There is little doubt that the Democrats in the House are going to try to make an example of Omar and scare the rest of the new House Democrats, and any others who might come along in the future. Ilhan Omar herself took the message and did apologize very quickly. When I see or hear the phrase antisemitic trope, I always assuming that I am reading or hearing a moron, an ignoramus, or a liar. When I see or hear the phrase antisemitic trope, I always assume that I am reading or hearing a moron, an ignoramus, or a liar. Wilkerson only confirms what should have been obvious to all, i.e. that the fact of being elected as a member of the Democrat Party, ie the main administrator of American monopoly capital and imperialist aggression does not allow her to speak or act freely. In fact, having been made to apologize already to the owners of the country may have destroyed her career — let’s hope not, but not too optimistic. Exactly. And when you ask how Jews as such were defamed, there’s no rational answer. NEVER! Rep. Omar has been Cynthia McKinneyed! How’s that for a term describing the vicious attacks on brave souls in Congress, like Omar, for speaking truth to Israel lobby power? 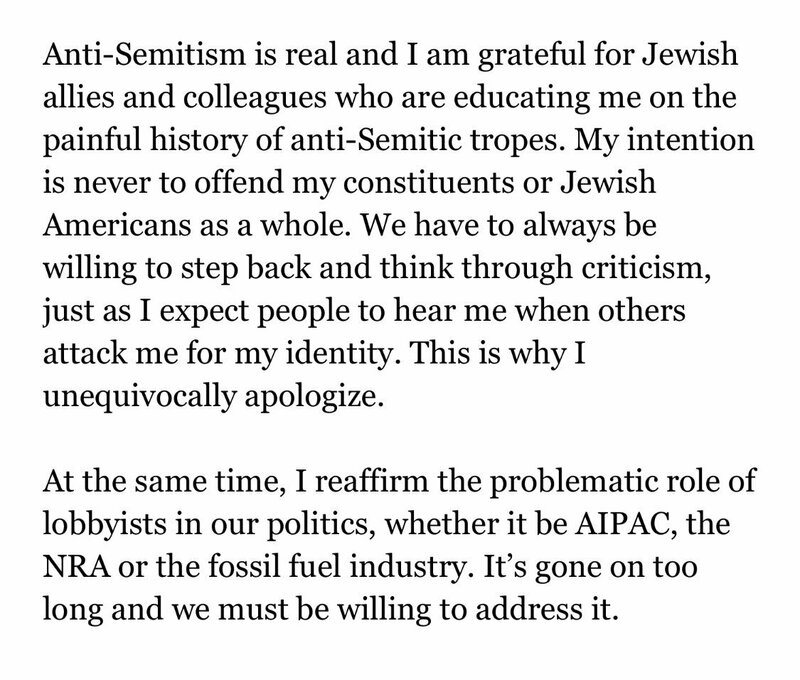 Haaretz is reporting that she already apologized but she managed to get it in the open. This tropes and memes business is just another way to suppress legitimate speech. It does this by shifting the point away from something’s being true or false to the irrelevant issue of whether someone who was truly an anti-Semite once said it. A similar shift is to claim that the statement implies an a-S trope and thus may not be spoken, regardless of whether or not it is true. A very good post. I don’t think I’ve ever heard the word ‘trope’ used about anyone other than Jews, and then almost always in the context of trying to silence criticism of Israel. Are blacks, or Buddhists, or Chinese or anyone else never the subject of ‘tropes’? That a lone pro-Arab dissident has issued a hostage video apology for suggesting that Israeli money runs Congress should certainly prove that Israeli money doesn’t run Congress. New York Times has this on their front page and has even allowed comments !! Some of the comments indicate that Americans including Jewish Americans are becoming sick and tired of this Anti-Semitism and Anti – Semitism “trope” b.llocks. They are also sick and tired of being sold the bare faced lies about AIPAC/Jewish mega donors etc. Sad but not surpising that Pelosi et al are still towing the AIPAC party line but the times they are certainly a changing. The simple fact that there is now a main line MSM discussion about the Japanese Knotweed Zionist Lobby and its control of American policy is a huge step forward. BTW Have Zionist Jews taken out some sort of patent on the word” trope” just as they have appropriated the term Anti – Semite ? Are there Catholic” tropes” , Baptist ” tropes” , Hindu “tropes”,Pagan “tropes”. Ossinev , I see Antisemitism in the Labour party is back on the front pages again. BBC is reporting that (circa my addition) 650 new cases of A/S in the labour party have been reported by the party.Some 65 people have been expelled and some 200 others are to be investigated. Margaret Hodge is right in the middle of this latest witch hunt. amigo, Hodge claims to have *made* 200 of the near 650 accusations in the ten months to January! There is no proof that the individuals reported are even members of the party when most is gleaned from social media where anyone can say anything. Yup. She claimed that she personally made 200 complaints and is now whining that the number of alleged anti semitic incidents was too few! Which proves once again… some people are never happy. Hodges et al were demanding that this number be released, and now when it is released they’re complaining that it’s not good enough. Because it’s never enough. And this from Hodges, who in her 40 years as a politician never seemed to much care about anti semitism until Corbyn became leader. Indeed, while she disagreed with him vocally for years, she never accused him of being an anti semite until last year. And isn’t it interesting that Luciana Berger – who we couldn’t criticise last week because she was 8 months pregnant – is on the case too. So her pregnancy makes her immune from criticism but doesn’t stop her criticising others? Hmmm…..
Corbyn made a huge mistake in not knocking this on the head years ago. I’ll be generous and call it naivite but it was certainly a major error. For all those leaving, or threatening to leave, the UK because of Corbyn and the Labor Party’s so-called anti-Semitism, all I can say is ‘B’Byyyye!! :-)’. amigo, ossinev, update on La Hodges 200 complaints. ° There is no indication of the disposition of those cases (ie, whether dismissed as unfounded, warned, asked to undergo training, or expelled from the party). I saw this on BBC and only caught the back end of the article. Thanks for adding your points. Clearly the LFI folks don,t care where or what they post as long as it serves their purpose , which is to prevent JC from ever having the opportunity to declare Palestine as a State. This possibility is throwing them into a tizzy and there is no limit to what they will do to prevent it–up to and including taking him out. For the triumphalist zio smug Alecs who think they have prevailed—think again. ” “It is not those who can inflict the most, but those that can suffer the most who will conquer.”Terence Mac Swiney. An “uppity” tweet followed by a grovelling tweet? To what purpose? I might add that I don’t “tweet”, and I find all of these political tweets dragging the discourse even farther into the mud than it already is. Yet another example of the internet as an instrument of social control. Yes have just read the latest. Some questions over whether the actual details of the alleged as in alleged cases of Anti Semitism (yawn) will be made available to Labour Party members and the general public and whether the figure is a bottom trawling catch all under the ludicrous IHRA definitions. Oops there`s another one to add to the Anti – Judaism statistics. What is that they say in Dublin – do they think we came up the Liffey in a bubble ? I cringe every time I see Democrats standing with Crooked Bibi, fawning over him. He controls America, and despite knowing it, they keep showering him, and Israel, with unwavering love and support. They know Bibi is under investigated and on the verge of being indicted, yet they will prostrate themselves in front of the war criminal. The road to the White House, and Congress, goes through Israel first, before it reaches the American people. Anywhere in the world, that much is understood. It is unfortunate America has come down to this. News flash: tonight, Monday, on the PBS Newshour, there was a segment in Politics Monday where BDS, the whole anti-semitism controversy, and the rift in the Jewish community are mentioned prominently. Check it out. I totally fail to see where disagreeing with israel’s government is an act of anti Semitism. What I am is ANTI ZIONIST – for what they are doing to all Palestinians. But of course, little does it matter with what we smear, the main thing is we smear. Disagreeing is one thing, dealing in anti-Semitic tropes, three if your counting, is quite another thing. The darling of the BDS has one and only one thing on her mind. @Jackdaw: I’ve been to JVP meetings that were packed with Jews – of all ages – who support BDS, and in all the conversations I’ve had with people I can’t discern the slightest hint of ‘anti-semitism’ or self-hating Jewishness – it’s all ridiculous. Try going to some of these meetings and try actually talking to people. Yet another Zionist chimes in with yet another anti-Semitic conflation of Zionism and Israel with all Jews and all Jews with Zionism and Israel. Why do Zionists insist on hating Jews so much?! What a pathetic mealy mouthed unfounded accusation. And from the same person who claimed he couldn’t be rscist because one of his true friends…. hahaha yer a riot Alice. She’s twice the man you’ll ever be. And yes I would say it to your face just so you know before you spray your artificial testosterone all over the pages. Is there a JVP branch here in Israel? No, she’s a coward who backed down and apologized in a matter of hours. And BTW, here is a ‘fun fact’ Rep. Omar should consider. In 2018, pro Israel lobby groups (including AIPAC) spent about $5 million on direct lobbying efforts beyond campaign contributions; pro-Saudi groups, for a rough contrast, spent $19 million from the beginning of 2017 until October 2018. Maybe tomorrow Rep. Omar will have something to say about Saudi ‘Benjamins’ buying off Congress. Ho dare you! That would be anti-Semitic. You know, Saudi Arabians, money, power. The old tropes. It seems that you only have one thing on your mind. As was mentioned elsewhere, this figure is misleading because, as you say, it only counts ‘direct lobbying efforts’ and does not include the huge sums changing hands behind the scenes. And if she did, no doubt there’d be a nationwide fit of pearl clutching and demands for an apology, since it’s a well-known ‘trope’ thatoil-rich Arabs are shifty and think money can buy anything. “Jackdaw”, don’t you understand, we are perfectly safe from “anti-Semitic tropes”. Why, who would dare say anything bad about Jews, when we say such nice things about everybody else. And often quite gratuitously, too! We will shame them for lowering the discourse. She didn’t, and she won’t, and she won’t take on the N.R.A., big pharmaceuticals, defense contractors and many other mega lobbyists. She saves her ire for the Jews. BTW, I’m recommending a movie I saw the other day, Spike Lee’s, ‘Black KKKlansman’. Actually, Jackdaw, she has been a very harsh critic of the Saudis. Good for her criticism of Israel and Saudi Arabia. But the point, before you deflected, was money and lobbying Congress, not human rights. || Jackdaw: … she won’t take on the N.R.A., big pharmaceuticals, defense contractors and many other mega lobbyists. So much Jew hatred in such a small comment! First you (yet again) anti-Semitically conflate all Jews (or, as you Zionists like to call them, “the Jews”) with the (pro-)Israel lobby, and then you argue that anyone who targets a lobby group like the NRA or big pharma should also target “the Jews” (i.e., all Jews) instead of the (pro-)Israel lobby. Seriously, man, why do you Zionists hate Jews so much?! You’re half right as to what transpired,which is pretty impressive for you, but she didn’t back down at all. And she certainly isn’t a coward. She called out the neocon war criminal Abrams for what he is as an added bonus today. No need to even entertain it. AIPAC is all about securing “see no evil, hear no evil, speak no evil” by Congress and our citizens, of anything related to Israel, Zionism or any other project initiated by members of AIPAC and their sycophants. And don’t fall for the line that they do good work in some areas. All supposed good work is connected to their bad work. Not a good look for the Democratic speaker of the House of Representatives to pressure a freshman Democrat to apologize for a truthful statement. Not a good look for the leadership team of the Democratic-controlled House of Representatives to join as one voice in criticizing a freshman Democrat – instead of first bringing this issue to all of the members. The lifeblood of Zionism in the US political arena is to banish any thought of discussion or debate. Pelosi and the rest of the leadership went along with this Zionist strategy. The leadership knows Zionusts will never be satusfied. No apology will ever be enough. An effort will be made to remove all Israeli critics from the elected ranks of the Congress. Nancy Pelosi, Steny Hyer and the rest of the leadership have sacrificed their integrity as real leadership. They will sacrifice even members of their own party to keep a semblance of power in their own hands. Shameful. On the plus side all of this debate about “tropes” and the increasingly boring megaphoned accusations of Anti – Judaism is definitely releasing the stench from the Zionist/AIPAC sewers. The younger generation of Americans including young Jews can definitely smell it and are addressing it. The older Americans including the bought and bent Pelosis are totally immersed in the cause of the stench and will continue to do their damnedest on behalf of their employers to ignore or spin it but remember they are yesterday`s people. “If i say “the Israel lobby is buying and paying for some of US’s decisions concerning the Middle East (ME)”, how different is what i am saying from what New York Times columnist Tom Friedman said in 2011? (this is what he said:”[the] standing ovation [Israeli Prime Minister Benjamin Netanyahu] got in Congress this year was not for his politics. That ovation was bought and paid for by the Israel lobby”). Given that Mr Friedman is a supporter of Israel and not someone who is willing to engage in Antisemitic (a/s) speech acts, isn’t it rational to both believe that there is pro-Israel influence on US policy with regard to the ME and to also use the same expressions that Mr Friedman used? Ms Goldberg suggests that her problem is with the phrasing of Ms Omar’s tweet (a phrasing that was no more provocative than Mr Friedman’s phrasing). But then why doesn’t Ms Goldberg suggest a way that critics of this particular aspect of the relation between Israel and the US can use to make their case in a non-a/s way? Surely, critics of the (not just monetary) influence that pro-Israel activism has on US policy in the ME should be able to voice their concerns about the damage done to Palestinians due to US ME policy , and they should also be able to offer causal explanations for this policy, because causes hint to policy solutions. They can’t do so if their speech is deemed a/s no matter how they phrase it. 1 I want to talk about the political influence in US that says that it’s ok for pro-Israel activists to push me via the use of Antisemitism allegations for allegiance to Israel, and I want to talk about this because these pro-Israel activists are doing the pushing motivated by dual loyalty, namely by a disposition to prioritize the interests of Israel over equally important interests of the US. 2 I want to talk about the political influence in US that says that it’s ok for pro-Israel activists to push me (via the use of Antisemitism allegations) for allegiance to Israel, and I want to talk about this because these pro-Israel activists are pushing and they don’t have the right to push me, or anyone else, to be pro-Israel, because support for Israel is just not the kind of issue that would justify such forceful pushing – given that Israel is just a foreign country. “Dershowitz indisputably represents one of Israel’s staunchest ?and most articulate public supporters. Yet, he is a fully committed Democrat and until recently, ?supported the president, insisting that he was a committed supporter of Israel.? In recent months Dershowitz appears to have become increasingly exasperated with Obama’s ?Israel policies. It would have been difficult a year or so ago to visualize him sharing a platform ?with Pastor Hagee or even the right-wing Republican Senator Cruz. Yet, in his remarks, ?Dershowitz referred to Cruz as his former student at Harvard Law School and a friend. He ?stated: “Israel must always remain a bipartisan issue. ? And we must explicitly express ?appreciation and admiration for those who stand up for the state of the Jewish people, even if ?we disagree with their other political, theological or social views.”? To be anti-Israel is to be anti-American, that’s the standard of allegiance to Israel that one of the most prominent Israel advocates imposes on politicians. No wonder Rep Omar revolted and said that she is “told everyday that … [she is] anti-American if …[she is] not pro-Israel”. One of the policies of pro-Israel advocates is clear: no dissent, or else allegations against your patriotism. And we just heard this policy from the mouth of a very prestigious advocate, prof Alan Dershowitz. So the complaint of Mr Stephens is misplaced, the correct characterization of what is required of politicians regarding Israel is indeed “allegiance”. One wonders why pro-Israel activists are so eager to accuse her of uttering Antisemitic tropes, given that she immediately explained that she does not attribute dual loyalty to her fellow American Jews who push her to show excessive support for Israel. And her interpretation of her own words is certainly authoritative, given that the fact that there is a very clear interpretation of her comment along the lines I sketched in 2, which is what Rep Omar herself more or less said in her series of explanatory tweets. Was it the word “allegiance” that triggered the pro-Israel activists? But then why not tell her just not to use that word anymore because it might bring to mind dual loyalty allegations. ?Why do they misinterpret her statements against her own interpretation? The substance of the discussion concerning the pro-Israel lobby revolves around issues that only experts are capable of offering to us in a digestible and concise form. There is no shame in not being an expert on American foreign policy in the Middle East and on the workings of the blob that produces it, and it is clear from their tactics that pro-Israel activists are going to try to smear her as ignorant and naïve. She should resort to advice from the foremost expert on these issues and try to bring him up as often as possible by explicitly stating that she consulted him – obscurity is what pro-Israel activists want to impose upon prof Walt, because he is not going to be an easy victim in debates. The labels are not always about Antisemitism. As we saw, they are also about being anti-American. So, Ms Omar, given that she was nonculpably ignorant of the effect that her utterance would have, cannot be blameworthy for the utterance. We could call her utterance “Antisemitic in effect”, to stress that there was no foreknowledge of the Antisemitism but that there was still a (presumed) deleterious effect upon Jewish people – that effect being either a feeling of hurt or uneasiness on the part of Jewish people who come into contact with the content of the utterance, or the increase in risk that Jewish people will be somehow harmed due to the extra entrenchment of hate into people’s minds ( both these effects, i.e. the hurt feelings of Jewish people and the risk of entrenching Antisemitic hate further in the minds of people, have been stressed by pro-Israel activists in recent discussions about Ms Omar’s tweets). But why do I claim that Ms Omar was nonculpably ignorant? Wasn’t this truth about the effects of the word “hypnotize” some sort of knowledge she should have? The answer is “no”, and the reason is that such knowledge is so esoteric, so rarely expressed in online discussions about Israel/Palestine, that no one could reasonably expect of Ms Omar to know it. I have been following discussions on Israel/Palestine in various comments sections and online posts for the past 6 years, and I have come to recognize easily an abundance of Antisemitic tropes (I learned about them by hearing Jewish commentators protesting them), yet this particular one was news to me. I could have used it myself. Ms Omar, then, is clearly not blameworthy for having uttered that Antisemitic sentence with the hypnotism. (Objection: the hypnotism trope was not in any interesting way Antisemitic; though it was Antisemitic, it did not involve any culpable state of mind, and Mr Shapiro’s censorious poignancy would be apt only if Ms Omar was indeed culpable in some or other way. But she wasn’t. She just didn’t know what it means to mix hypnotism with Jews). The “obviousness” exists only in the vigilant eye of the pro-Israel activists who are looking for any handle around to shut undesirable discussion about aspects of Israeli policy. The rest of the world know nothing about the hurtfulness of connecting Jews with hypnotizing. But such bad faith on the part of pro-Israel advocates, even as Rep Omar explicitly states that she was ignorant of the trope, poisons the discourse about Rep Omar by adding repetition upon repetition of the falsity that Ms Omar was somehow culpable for the hypnotism trope. Conclusion: the persistence of hurled accusations against Ms Omar for the first hypnotism tweet, even after she has plausibly claimed nonculpable ignorance, is an indicator of bad faith on the part of pro-Israel activists who still keep accusing Rep Omar for the hypnotism trope. The dual-loyalty conundrum becomes much simpler if we restrict the charges to those who have broken US laws and regulations to advance Israel. That’s a wide enough net to work with and still catch plenty of big fish. Blame is allright, there’s plenty to go around, but Federal charges under FARA or the laws prohibiting transfer of money to illegal enterprises would be better. Any case in which an organization or individual doesn’t comply with FARA laws. Or supplying money to a criminal enterprise like the upkeep of a settlement or outpost. Actually, Jackdaw, you were making sweeping comments about Omar, trying to argue that she is an antisemite, and so the fact that she has been very critical of the Saudis is evidence that she isn’t fixated on “Jews”, but on human rights. Gee Nancy I was just starting to appreciate you because you seemed to do a good job standing up to idiot face, but now you are back to your old racist zionist genocidal shenanigans. Shame on you! This is why I am not a Democrat and do not ever donate to the DNC. Now that “Pres. Trump Declares That The Democrats Are The ‘Anti-Jewish Party”, who would?